The Secretary Cabinet Division, Mr. Abdur Rauf Chaudhry has said that 3G services would hopefully be available to the Pakistan mobile users by the end of 2011, while it is expected that the Policy for auction of 3G services licenses would soon be presented to the government and Economic Coordination Committee (ECC) for discussion and approval. He said this while speaking at a seminar organized by Pakistan Telecommunication Authority (PTA) in collaborat0ion with Qualcomm and Central Asian Cellular Forum (CACF) at Islamabad on 3G mobile services. 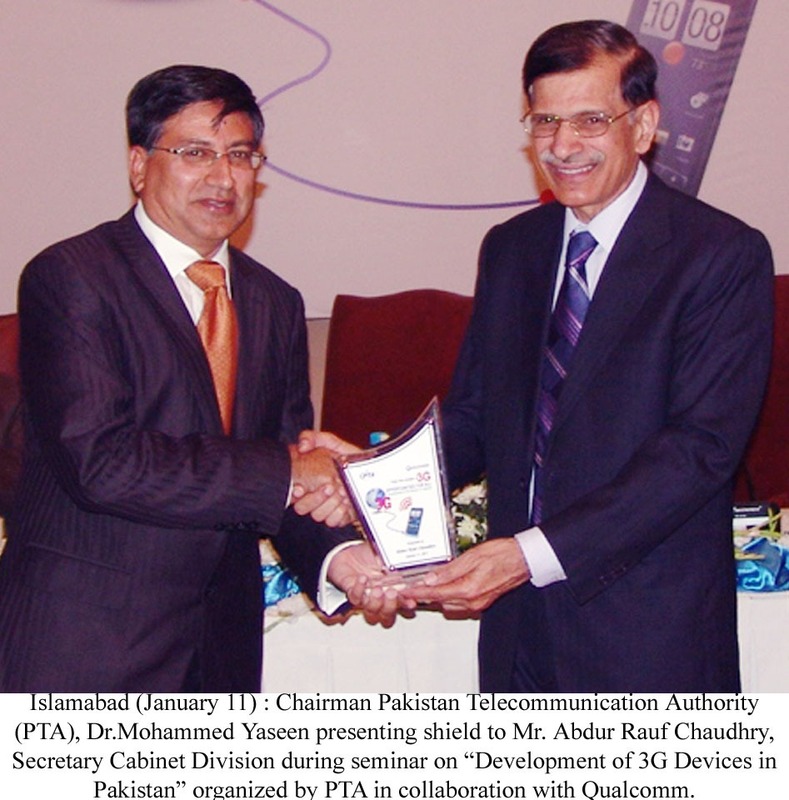 The theme was “Opportunities for All: Development of 3G Devices in Pakistan”. Chairman PTA, Dr. Mohammed Yaseen, moderated the ceremony. Delegates from Board of Investment, Pakistan Engineering Council, Ministry of IT, Representatives from Qualcomm, IT & telecom Industry experts, CEOs of telecom companies, International Original Equipment Manufacturers (OEMs), Local Investors, Mobile Distributors, Academia and media representatives attended the seminar. The Secretary said that the local manufacturing of 3G handsets is very important and govt would consider the recommendations given by the Industry during the seminar. On this occasion, Chairman PTA, Dr. Mohammed Yaseen said that by the end of this quarter we will be able to roll out plans for 3G services once the Policy is approved by the Government. He said that handset manufacturing is a vital segment of mobile Eco System, by the end of 2011, there will be an estimated sales volume of 300 million 3G mobile handset around the globe. Pakistan offers an excellent opportunity for investment in 3G handset manufacturing with availability of skilled manpower and upward growth of mobile market. He said that creation of a favorable climate for high value added, low cost R&D, production and marketing will certainly instigate investment window in the country. During the seminar Chairman PTA also delivered a comprehensive presentation to highlight the worldwide practices regarding 3G manufacturing. He presented various investment incentives offered in various countries. Chairman also highlighted the present 3G handset market in Pakistan with necessary future roadmap to promote handset manufacturing industry in the country. Mr. Raheel Kamal, Mr. Sanjeet Pandit and Mr. Hani Yassin of Qualcomm also made presentations highlighting magnitude and importance of 3G Manufacturing in Pakistan. During the seminar speakers of International fame focused on the pre-requisites for handset manufacturing proliferation such as incentives, mutual coordination, infrastructure development and technology research. Mobile phone has become the biggest platform available today with almost 5 billion wireless subscribers, of which there are more than 1 billion 3G subscribers in the world. The 3G number is expected to grow to 2.8 billion by 2014. With upcoming 3G auction in Pakistan and network rollouts in the near future, the industry would be benefited from the data growth and exciting applications and services on the 3G networks. Various full-featured mobile operating systems such as Android, Windows, Java, Brew MP, etc., continue to drive the proliferation of mass-market Smartphones offering thousands of applications, services and mobile content. baatain kara lau. Ab qualcomm 3G kai chakkaron main manufacturing ke story phaink rahi hai. The world didnt find us fit enough in good days to manufacture GSM handsets in Pakistan and why would they consider manufacturing 3G handsets without have an actual market as well as the the investment incentives. A wshful thinking is what PTA is trying to dream and dream knowing fairly well that the way to 3G is not through making money but by giveing the spectrum and tying with regulatory attractions. In my opinion, there is no need for 3G in Pakistan yet. i think u don’t know about 3G tecenology . so don’t leave comment next time against 3g technology ok..
why would anyone invest in any technology manufacturing in pakistan. we bearly have enough electricity to run other busnesses in the country, and how do you expect people to get to work with infrastructure accrosss the country collapsing on a daily basis. i would hope some of the more fundamental issues are addressed before the govenment trys to convince us they are interested in making these things happen. dont hold your breath !! I really hope they do it this time. Previously it was Chairman PTA the Retd Gen Sahib who put up a whooping price on the spectrum, obviously none of the operators complied. Now we have another story, another deadline. And what about the millions of 3G mobile phones being purchased by Pakistanis? What is the point is having a 3G set that is underutilized? I think we are very late in shifting to 3G thanks to our Governments. Well! Good news for us that 3G is coming. I really appreciate the efforts of PTA for conducing such seminars/events. I hope very soon all pakistani’s will enjoy the 3G services. Everyone is commenting 3G is comming lol, they will first provide the idea inforont of Government to approve, do you guys think they will aprove? Do you guys think our it minister who dont know about fullform of IT would be aware of 3G, and its demand? FORGET ABOUT PAYPAL AND 3G PEOPLE.